Minister Raphael Trotman speaking with miners at Mahdia last Saturday. An enforcement operation underway in Mahdia to address mining safety has resulted in cease work orders being issued and the removal of some operators, according to the Natural Resources Ministry. Just over a week ago, Minister of Natural Resources Raphael Trotman ordered an immediate enforcement operation in the wake of the death of a miner in a pit cave-in at Mowasi Backdam, Konawaruk, Potaro. 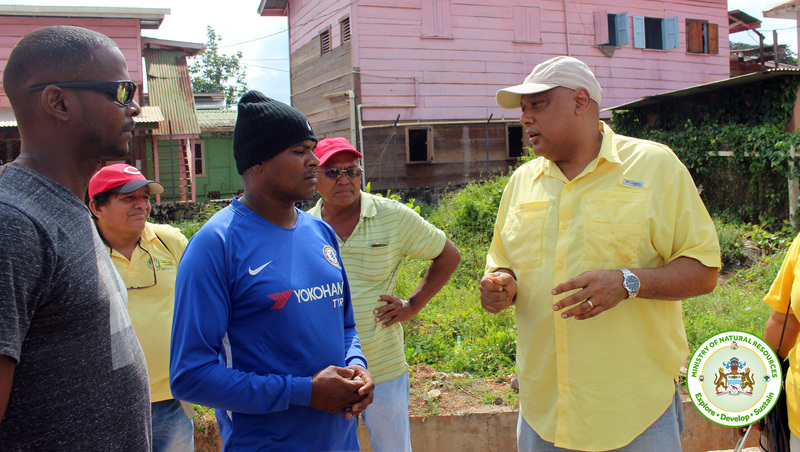 According to a statement issued by the ministry on Saturday, Trotman visited Mahdia and received updates on the ongoing enforcement operation. Acting Mines Manager at the Guyana Geology and Mines Commission (GGMC) Krishna Ramdass was reported as saying that the operation, which is expected to last eight days, began on Friday and had seen the deployment of a team comprising of five wardens from the ministry’s Compliance Division and 12 GGMC officers. Ramdass added that the operation had managed to already identify mining operations that did not conform to safety, issue cease work orders, and even completely removed some operations from the environment. He further noted that some areas were cordoned off, and instructions were given to operators as to what is required to resume operation. Other facets of non-compliance will be dealt with as the exercise continues, the statement added. Trotman also took time to address concerned miners and urged them to allow the smooth flow of the operation, ensuring that their documents are in check so as to avoid issues with the process. He briefed them on the process and further encouraged them to practice legal and safe mining practices. Enforcement operations are being launched in other mining districts and a report is expected at the end of the process, the statement also said. 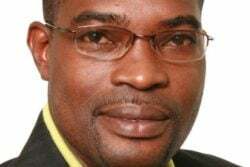 It was the death of miner Lennox Douglas, 33, a resident of Canvas City, Wismar, Linden, in a pit cave-in at Mowasi Backdam, last week Monday, that resulted in the minister ordering the operation. The surviving miners reported to the police that they were all in the mining pit operating a four inch dredge when a section of the wall collapsed and struck Douglas to his head. He was picked up and taken to the Issano Health Centre, where he succumbed while receiving medical attention. In announcing the enforcement operation, the ministry noted two other recent mining related deaths in Mowasi Backdam, Konawaruk, last month. On September 17th, miners Deon Sproston, called ‘Jersey Joe,’ 36, of Mabaruma, North West District, and of Lot 133 Mon Repos, East Coast Demerara, and Shawn (only name provided), a resident of Aishalton Village, Rupununi, died in a pit cave-in. At the time, the ministry said, they were engaged in illegal mining on a concession. Police had said the two deceased along with other persons were working at the pit wall, when a portion fell on the deceased men. At the time, the rain was pouring and a large portion of the pit wall broke off and fell on both deceased, covering them with large stones and gravel/mud, police explained. Persons who were at the mining pit rushed to their rescue but were unsuccessful. The men’s lifeless bodies were pulled from the debris two hours after the collapse. Their bodies were rushed to the Mahdia District Hospital, where they were pronounced dead on arrival.